Like nettle plants on land, Pacific sea nettles can leave a similar sting. Recently, ODFW habitat researchers ran into swarms of these guys while doing acoustic marine habitat surveys just south of Cascade Head Marine Reserve (see the video below). Over the last month, marine reserves researchers have seen sea nettles during SCUBA dive and video lander surveys at several reserves. 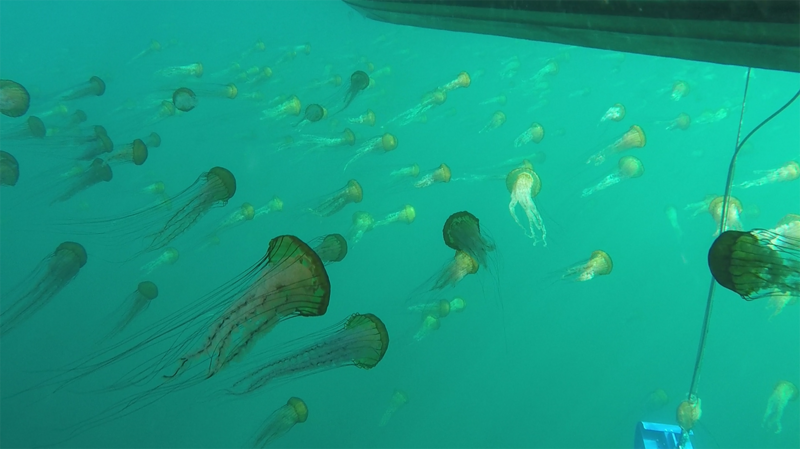 Sea nettles tend to be more abundant when ocean productivity is high – and this year’s big upwelling helps explain why they are more common right now (there’s lots of food in the water for them to eat). Interestingly, researchers have noticed higher sea nettle numbers this past spring, relative to 2016. The lower sea nettle numbers last year were likely a byproduct of the warm water ‘Blob’ that resulted in less productivity off our coast.